This year’s special evening raised more than $25,000 with more than 300 attendees! We appreciate everyone who attended and made it such a fun evening, especially our 12 extraordinary fashion model Groundbreakers. The fabulous WSMV anchor Tracy Kornet emceed the evening, along with Tina Adams, Your Style Vault, who talked about all the fashions. Proceeds go to support Women Build with this year's future homeowner Shameka. Please join us for a fun-filled evening of networking, shopping, a fashion show featuring our Groundbreakers, specialty cocktails, hors d’oeuvres and a swag bag. One hundred percent of the ticket sales and a portion of Dillard's proceeds from the evening will go towards Women Build. For more information, contact Lauren Lane Payne at llanepayne@habitatnashville.org. 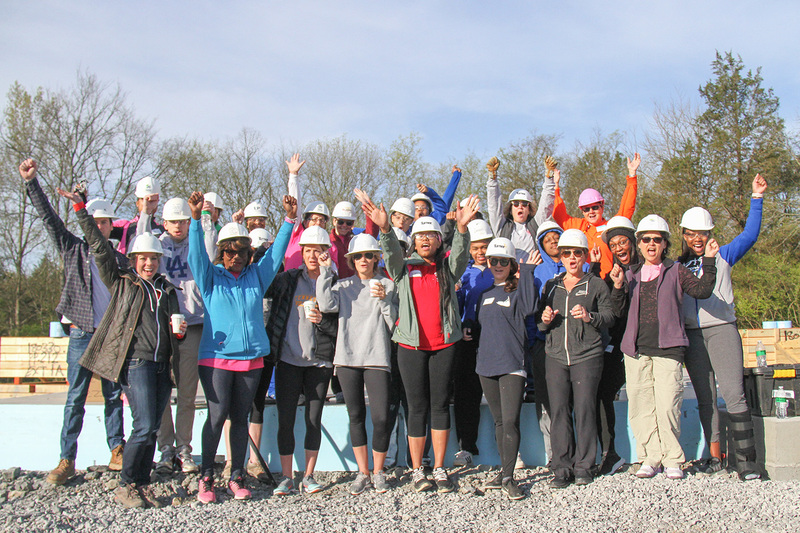 If you would like more information about volunteering for this year's Women Build, email Karel Straughn at: Kstraughn@habitatnashville.org. Shameka looked at the exposed electrical wires in her two-bedroom apartment and just shook her head. Her apartment is affordable but the constant maintenance issues worry her, along with the talk that the apartment complex might get sold to a developer. There is no place for her two young daughters to play outside and the frequent gunshot sounds make her nervous. She wants a safer and more stable environment for her family. Shameka got her certification as an administrative assistant from the Tennessee College of Applied Science. She is also a certified nurse assistant and has worked as a caregiver most of her life. She currently works at AbilisHealth as an intake assistant. She would like to further her education in insurance verification one day, but first she needs to find a better environment for her family. Shameka has several family members who are Habitat for Humanity homeowners, including her mother, and she likes the stability that a consistent monthly mortgage payment offers them. “Habitat is affordable and it’s a good program,” she says. “It makes me believe in dreams and motivates me to stay positive. I am a single mother who is trying to give my kids a better life.” Shameka qualified for the Habitat homeownership program and is attending homeownership classes and will work with her sponsors on the build site to earn a 0% APR mortgage. She wants her children to be able to play outside and live in a safer environment. Women Build is a unique partnership of female community leaders, along with companies focused on women as executives and mentors, coming together to sponsor, build, and dedicate a house for a female homeowner. Women Build is focused on the power of networking to help women achieve their goals, including making homeownership a reality for a Habitat partner family each year. For more information on how you can get involved in Women Build or for more information about Couture Construction, contact Lauren Lane Payne at llanepayne@habitatnashville.org.